On the morning of Saturday, October 10th, two bombs exploded among protestors during their peace rally in the area of the central railway station of Ankara. The rally had been called by many political organizations and trade unions and it involved thousands of protesters from several cities of Turkey. They were protesting for peace and freedom. Immediately after the bombing, the Turkish forces of repression hustled to use tear gas against the wounded and the people who were trying to nurse them. Over a hundred and twenty demonstrators were killed and hundreds more were injured. Whoever the perpetrators of this attack were, whether the Turkish deep state or the religious fundamentalists of ISIS, the fact remains the same. Those who benefit from this attack are the Turkish state and the ruling party AKP. 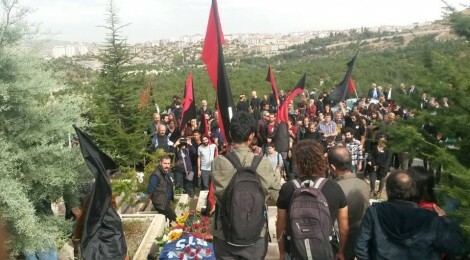 The rally was hit because it was against the bloody, repressive policies of the Turkish state and the AKP, against the war the Turkish forces are engaged in for months in the south-east border of the country, against the war that has been unleashed on the male and female Kurdish fighters. Just a few weeks before the Turkish general elections, the AKP rushes blatantly to exploit Saturday’s bomb attack and the assassination of protesters, trying to bring the Turkish society together around the ideological construct of national unity, to intimidate and silence anyone who dares to resist, so as to strengthen itself politically and to ensure the smooth continuation of the military operations of the Turkish army. We will in no way forget the dead of our class; we will not forgive their murderers. We stand in solidarity with all the exploited and oppressed parts of the Turkish society, with all the Kurds and Turks fighting the repression of their struggles and the murderous attacks of the Turkish state. The bloody state and capital policies will be finding us all united and against them. ← The Working Class Needs Who?